This satellite image, captured by NOAA on Oct. 30, shows Tropical Cyclone Chapala as it nears the Arabian peninsula. Chapala is expected to make landfall over eastern Yemen between late evening Monday and early Tuesday. 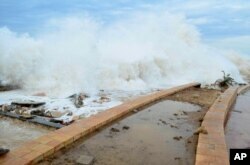 A second cyclone threatens Yemen, less than a week after Chapala struck the Gulf of Aden coast Tuesday, bringing massive rains that flooded the desert area, killed at least two people and displaced hundreds of thousands. Cyclone Megh has weakened since it hit land Sunday, shifting from the island to the mainland and heading for the Yemeni capital, Sana’a, as it dissipates. But the danger is far from over, according to the U.N. humanitarian coordination agency. Winds as strong as 120 kilometers an hour are expected to continue as the storm tapers off, according to OCHA. Winds up to 150 kph were reported during the height of the storm. Some residents say that, with this natural threat, ongoing war and the abject poverty that dominates the nation, they are growing terrified of the future. “All people here are very scared because the situation was already very bad due to the war" and al-Qaida controls "our city," said Shehab Hazem, a 23-year-old fisherman from Mukalla. "And now we have the cyclone, which has made it much worse." The U.N. refugee agency estimates more than 1 million people are affected by the storm, reported to have dumped years' worth of rain on Yemen in a matter of days. 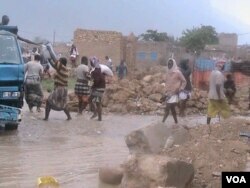 In Socotra, the island hit first by the cyclone, three people were killed and many others were injured, U.N. refugee agency (UNHCR) spokesman Edward Leposky said. "Over 1,000 families [were] displaced on the island, with many taking shelter in caves, schools, or in the homes of relatives," Leposky said. But assessments of the damage vary. Yemeni authorities reported 2,000 families displaced and 700 homes damaged in Socotra, an island of less than 50,000 people. "The residents of Socotra were expecting the cyclone, and they evacuated to the mountains, caves and schools," said Ali Saryeh, director of the emergency department at the Yemeni Ministry of Public Health and Population. Despite preparations, Yemenis were far from ready to endure Cyclone Chapata, their worst storm in decades. Continued heavy rain could cause more flash flooding, and officials fear mudslides, rivers of debris and the further destruction of Yemen’s beleaguered infrastructure. In Socotra, the storm destroyed nearly 250 boats and ships for fishing, a key industry in the region. Many farm animals have been killed, fields have flooded and orchards have been beaten down, according to General Abdullah Khamis Juma’an, who heads the rescue operation in Socotra. Electricity on the island is out, and drinking water pipes are broken, said Saeed Omer, secretary to the Socotra governor. But while many parts of Yemen are deeply embroiled in war, Omer said, Socotra has the small comfort of being able to safely receive international aid. Yemen’s civil war has left thousands of civilians dead this year, and most of the population are in need of immediate humanitarian aid. Long before the cyclone hit, aid organizations reported difficulty delivering emergency assistance because of the security crisis, fuel shortages and blocked roads. Tropical Cyclone Chapala batters Mukalla, Yemen, Nov. 2, 2015. Communications systems are still down in many parts of Yemen, and the full extent of the need is unknown. Of particular concern is Yemen’s health care system, which was barely functioning before the war. One hospital was evacuated Monday in Mukalla, crowding the rest of the overburdened system, said Dr. Mamdouh Afif, who heads another hospital in town. While international aid organizations may have difficulty traveling through the region, locally based groups were equipped to evacuate the most dangerous flood zones because of what they have learned from the war, Afif said, noting the sad irony. “These people have good experience in evacuating people during the clashes in Aden,” he explained. But the evacuations also separate people from their jobs, further damaging Yemen’s nearly collapsed economy, according to some locals.